By now you know that I am a big fan of anything that can be done by hand, without opting for store bought products. I can’t make everything at home. However, what I can make, I make :) These noodles are no different. With only 3 ingredients, you have something you can be proud of. I can whip them up pretty quickly, and store whatever I have not used until the next time. 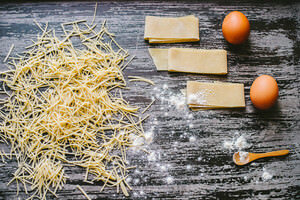 This recipe will yield enough homemade noodles for about 3 uses, serving 6 people each. These homemade noodles are egg based. That’s what helps the noodles from disintegrating in the soup. 1-1/4 cup flour (keep the 1/4 and add it only if the dough is sticking to your fingers). 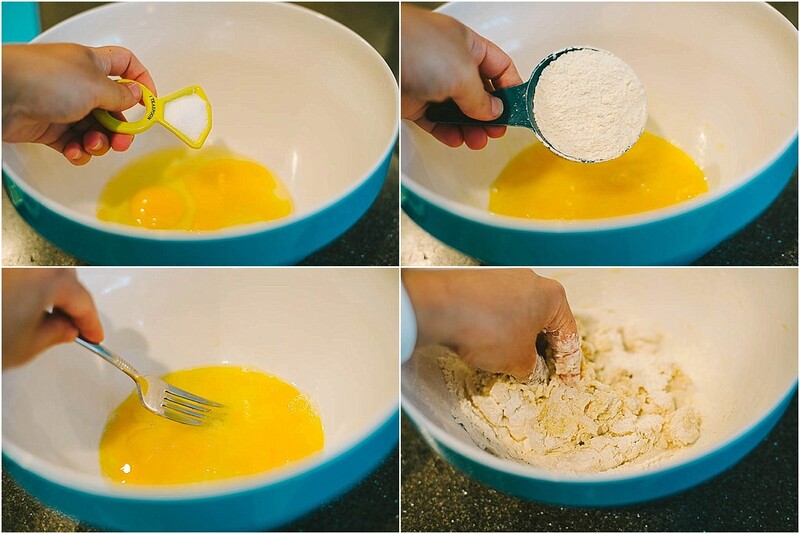 In a medium bowl crack two eggs, add 1 tsp of salt and mix these ingredients well. Add 1 cup of flour and start kneading the dough. 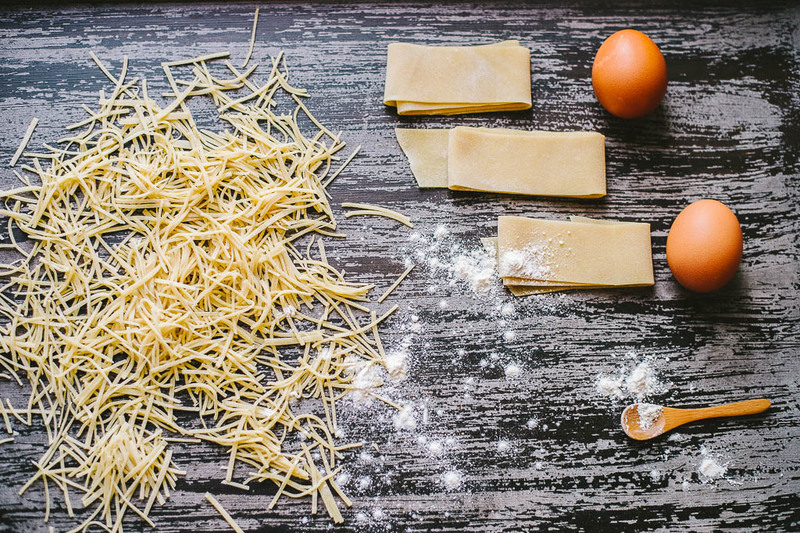 Since you are working with flour and eggs, the dough will get a little sticky. Do not freak out, keep on kneading the dough and add the rest of the 1/4 cup of flour as needed. You can also use the dough mixer for this step. That way you will not even have to touch the dough until it is well kneaded for you. If the dough got a little dryer, add a 1/2 TBSP of water and keep on kneading the dough. 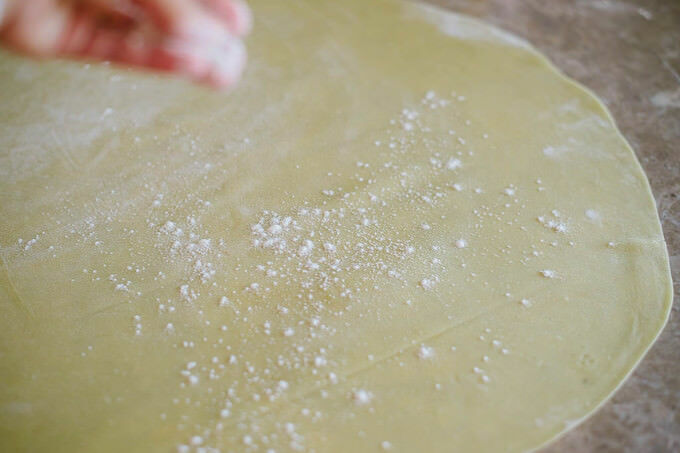 Once the flour is well incorporated (it may still be slightly sticky and a little on a harder side), wrap it in a plastic wrap and let the dough rest for about 20 minutes. This step is essential. Rolling the dough will be much easier once it has rested. Once the dough has rested, remove the plastic wrap and work the dough into a flat circle. 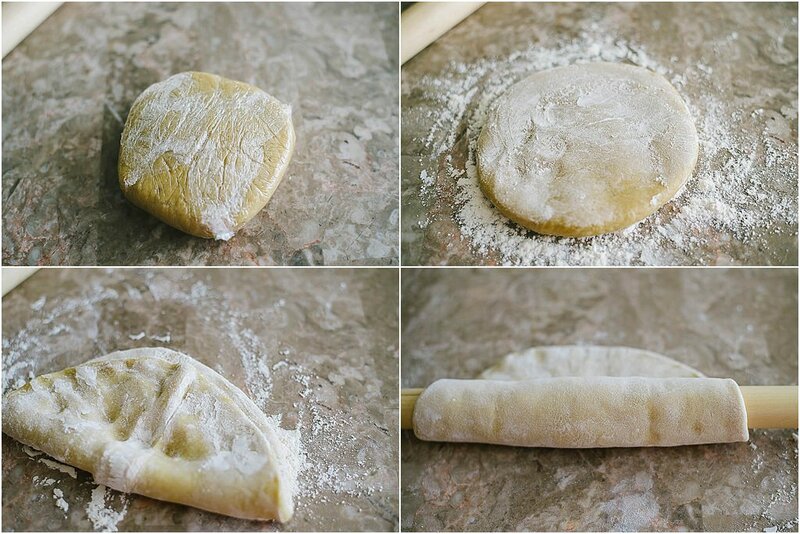 This process will have you working with a rolling pin. 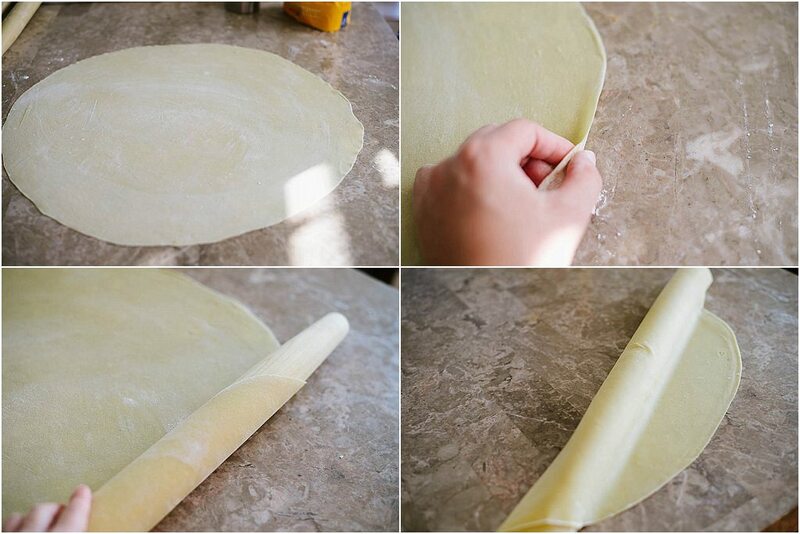 If you have a noodle machine, by all means use the machine to thin out and slice the dough. If you are using the rolling pin, follow along. Use your fingers, knuckles to shape the dough into a bigger circle. So long as the dough is wide enough to roll into the pin, you are good. Use flour as needed, this will help the dough from sticking to itself. Roll one side of the dough for a few seconds before you alternate to another corner of the dough. Catch another angle of the dough (best to follow the circle) and roll for another few seconds before unrolling the dough and pinning another corner. Again, use the flour as needed. 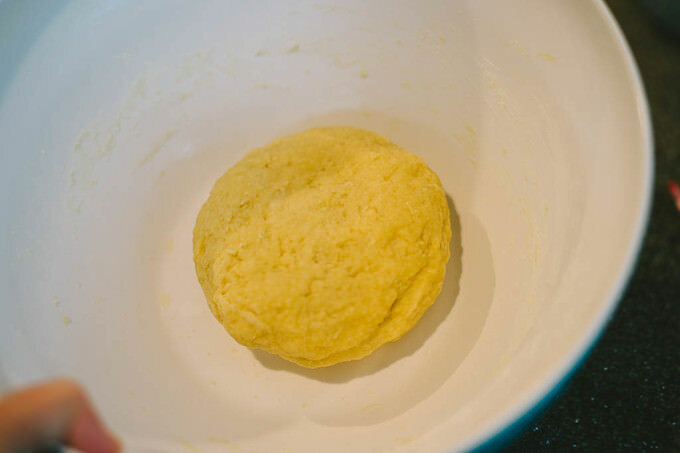 Once you make a thin enough dough (see the photo), sprinkle the top of the dough with flour and let it dry a little before you attempt cutting it. You can cut into it right away, but I like to wait a little for the dough to dry. Once the dough is dry it is so much easier to cut it, plus the noodles do not curl up. They will keep their shape quite well. Roll up the dough and cut it into 2 inch strips. Once the strips are cut, open them up hand to the side of the table (or anywhere, really). If your dough is still wet (or you are in rush), layer the dough strip with a little flour before cutting. Stack several strips of dough and using a sharp knife slice the dough in matchstick strips. Fluff the cut noodles and spread them out a little. You can dry them pretty much on anything. That’s it. You can use the noodles immediately or let them dry a little longer and pack them in the ziplock bag. THAT’S IT, you guys! Go make some noodles, mwah!